Horizontal Flow Wrapper (HFFS) Machine that makes a three sealing pillow pack for irregular or difficult to drag products. Optionally can make modified atmosphere (MAP) packing. This machine has the newest and most innovative developments. The new SIENNA family is the result of the ULMA commitment with innovation and the technological development. This ongoing process brings us a new family of machines with an improved performance and much more ease of use. The new SIENNA features all the strength, reliability, and operation easiness of the ULMA machines. 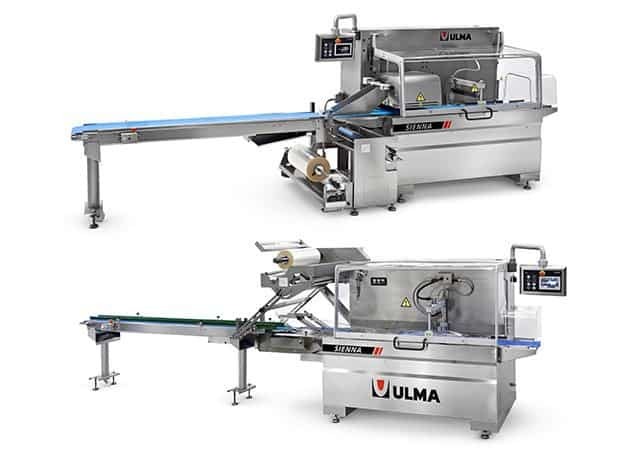 Added to these well known characteristics of ULMA, the new model also features a higher flexibility and versatility (as the sealing head is powered with an independent motor), together with a much easier operation thanks to its touch screen control panel. The great flexibility, proven reliability and the innovative technology applied to the new SIENNA family, turn this new family into the ideal packaging machine for a very wide range of applications in the food industry and specially in the produce, meat, cheese,… sectors. Machine is built on a stainless steel frame in a cantilever execution, to avoid dirt and dust accumulation and allowing an optimum cleaning and hygiene. It also gives an easy access to the mechanical and electrical components. Motorised height adjustment of the longitudinal sealing system to make it easier its adjustment. The box motion type cross sealing station is provided with 400 mm. wide jaws. The sealing head is equipped with an independent motor that provides a very high flexibility as it allows optimising the cycle time and also to produce minimum length packs. Easy access reel holder that easies the load of heavy rolls. It is equipped with a motorised film unwinding system for the optimum machine work. In-feed conveyor 2 meters long fully made in stainless steel. The touch screen control panel allows a simple and very intuitive access to the machine parameters. It allows various parameter settings for each product (bag length, speed, sealing time, etc…). The “No product – No Bag” and “Misplaced product safety” functions are standard in this machine. Mixture version for BOPP and shrink film. Low density polyethylene film version (LDPE). Various types and lengths of in-feed conveyors. Wide range of printing equipments is available. Photocell for print registered film. Special version for wide products with 550 mm wide jaws. Closing belts for short size products.